Earlier today we told you that the iPhone Dev-Team updated their popular RedSn0w Jailbreaking tool to support the iOS 5.1 firmware. Although you can Jailbreak the iOS 5.1 firmware there are some things you need to keep in mind. Firstly, this Jailbreak is only for the iPhone 4 and iPhone 3GS; not the iPhone 4S. Secondly, this is a tethered Jailbreak and not an untethered Jailbreak that we have been very lucky to have on the iOS 5.0.1 firmware. As this is a tethered Jailbreak it means you will need to plug your iPhone into your computer and re-run RedSn0w to boot your iPhone into a fully operational state every time it loses power. Lastly, iBooks will not work on the iOS 5.1 firmware until the iPhone Dev-Team have had a chance to implement a patch. If you understand the three points I have just brought up about this Jailbreak and meet the requirements you will be able to easily Jailbreak your iPhone 4 or iPhone 3GS on iOS 5.1 tethered. And in this how to guide from iJailbreak.com you will learn how to do just this using the Mac OS X version of RedSn0w 0.9.10b6. Step 1: The first thing you will need to do is download RedSn0w 0.9.10b6 for the Mac OS X operating system using the download mirror below or through the iJailbreak Downloads Section. Step 2: Once you have downloaded RedSn0w you will need to launch it by double clicking on the redsn0w app. Step 3: With RedSn0w running you will need to click the Jailbreak button. Step 4: After clicking the Jailbreak button you will come to a screen where you will need to put your iPhone into DFU mode. Step 5: When you click the next button you will need to follow the instructions presented to you in real-time to put your iPhone into DFU mode. 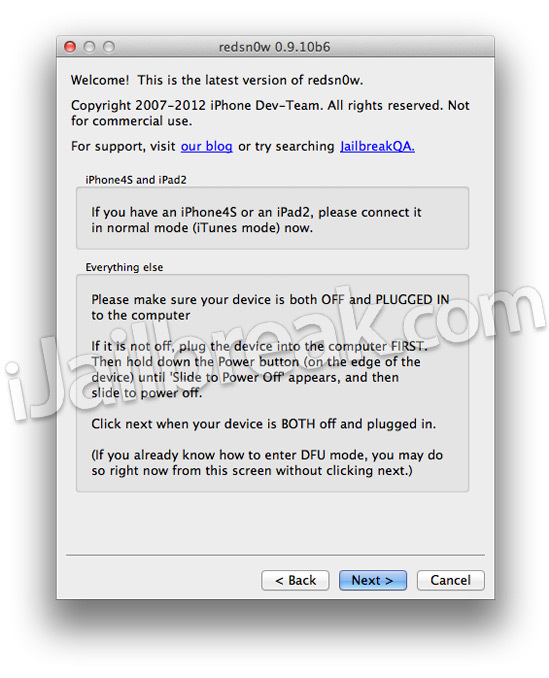 Step 6: After you successfully enter DFU mode RedSn0w 0.9.10b6 will begin preparing your iPhone for the iOS 5.1 Jailbreak. Step 7: Once RedSn0w has finished preparing your iPhone for the iOS 5.1 Jailbreak you will be asked you to specify options to go along with your Jailbreak. The only option that you actually need to make sure is checked is the Install Cydia option. Once you have ensured this option is checked, and any other options you may want, click the Next button. Step 8: After you have specified your Jailbreak options you can click the next button and RedSn0w 0.9.10b6 will begin jailbreaking your iPhone. DO NOT interrupt or use the computer during this time. When your iPhone is finished being jailbroken it will boot up with the Apple logo and not go any further. This is because this is a tethered Jailbreak and you will need to boot tethered with RedSn0w in order to get your iPhone in a working state again. Step 9: As explained previously when you Jailbreak your iPhone running iOS 5.1 you will have a tethered Jailbreak. Meaning in order for your iPhone to turn back on you will need to boot it using RedSn0w (this applies every time your iPhone loses power). To do this launch RedSn0w again and click the Extras Button > then click the Just boot button and you will simply need to put your iPhone into DFU mode again. Congrats! 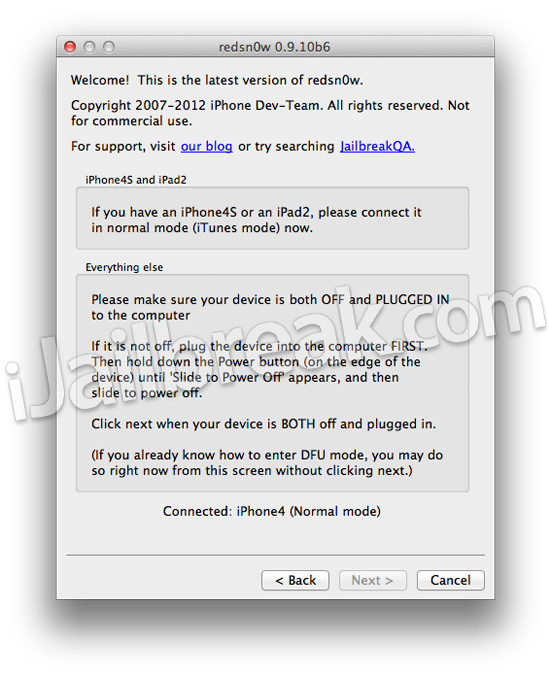 You should now have a tethered Jailbreak on your iPhone 4 or iPhone 3GS running the iOS 5.1 firmware. For more tutorials visit the How To Jailbreak Section. Leave any questions in the comments. That’s what i am about to do now. Hopefully i dont mess it up lol…WISH ME LUCK!!!! You may need to manually select the iOS 5.1 firmware then in the Extras menu before following the steps in this How To guide. Any idea why redsn0w won’t recognize the DFU mode my old bootrom 3GS? It actually is in DFU, I can go to System Profiler and see the bootrom version (something which is only possible in DFU mode), but redsn0w keeps saying that I didn’t follow its instructions correctly. why did my phone and messages icon go away? I’m having the exact same with my 3gs with old bootrom. i tried jailbreake 5.1 , but apple logostuckon my iphone 3gs , watidofor stuck apple logo? I jail broke my iPhone 4 5.1 using redsn0w and it died and now just keeps respringing and it won’t stop long enough for me to turn it off in order to put it in DFU mode! help! im on the same boat right now!!!! did you find a solution?!?!?!??!?!?! okay my Cydia app wont work. What do I do? No matter how many times I tried this , it does not recognise my SIM says , Searching for a long time and settles on No Service. I have an iPhone 4S iOS 5.1 (9B179) and my version of RedSnow is 0.9.11.b4 and i put my mobile on dfu mode (redsnow says to me) but it says its not supported … when we will can jailbreak the 4S ? please reply, why does it says package cannot be found, I tried downloading winterboard but it says for me to download more sources, but which one? all of them?! iphone 4 jailbroken unthered absinth it has been jalbroken for 1 month the battary was dead i put it on the charger then i got stuck on apple logo someone please tell me what to do.